In the following articles, we are presenting Sri Aurobindo’s views on some aspects of the Indian political system; it is not an exhaustive presentation, but in the present churning that is taking place in India, it will be useful to comprehend the deeper vision of Sri Aurobindo in politics. This view might help us to steer the national political mind in the desired direction. Soon after attaining independence, India gave herself a constitution and became a democratic Republic on 26 January 1950 and has since been governed by this Constitution. This was indeed a commendable achievement, more particularly when one looks at some of the countries in our neighbourhood and even around the world. For it established a system of governance, a sound legal system and a fairly sound basis for a democratic socialistic society where elections were held regularly and the popular mandate was respected. We may thus say that the democratic system has been established and accepted as an indispensable part of Indian political life; yet we have to recognise that in practice, there have been serious shortcomings and these will have to be addressed sooner rather than later. After more than six decades of our Independence, we have come to a stage, when questions are being asked about the workability of our democratic set up based on the Parliamentary system and about the utility and relevance of our vital democratic institutions. The question that arises is: how much of the fault lies in the system itself and how much in the misapplication that arises due to human frailty? If the fault lies in the system, we should take a close look at it and suggest changes more suited to the Indian temperament. Regarding the aspect of human weakness which is undoubtedly an important factor we shall not discuss it in this article for it will demand a deeper psychological approach. In this article, I shall try to present Sri Aurobindo’s views on Democracy and more particularly Parliamentary Democracy. We shall follow it up by making some suggestions for evolving a better democratic system more in tune with the Indian genius and temperament. Sri Aurobindo withdrew from active politics in 1910; but he continued taking active interest in politics and even wrote extensively on political thought in the Arya, a philosophical journal in Pondicherry. It is the European idea that makes you think that the parliamentary form or constitution is the best. The parliamentary form would be hardly suitable for our people. Of course, it is not necessary that you should have today the same old forms [as in ancient India]. But you can take the line of evolution and follow the bent of the genius of the race. All these statements were made long before India attained its independence; yet we see how prophetic they are. 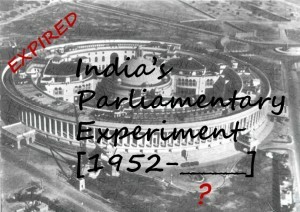 In this article, we shall first see that Democracy is not a modern phenomenon; it was practised with some measure of success in ancient Athens and in ancient India; also they laid down some of the fundamental principles of a democratic society which will be very relevant to us even in modern times. While we will not go a detailed study of these systems, we will point out some striking features that show how well they grasped the true meaning of Democracy. Some of those features are worth understanding and taking into consideration if we are to devise a new political system for India. The above remark of Sri Aurobindo’s on parliamentary democracy is an excerpt of a conversation he had with his disciples in 1926, and appears in Purani-ji’s book Evening Talks with Sri Aurobindo. For interested readers, we are excerpting here a larger portion of this conversation below. At the very onset of this book, Purani-ji inserted this note below which is worthwhile reproducing here as a conversation is being quoted. The reader is requested to note that Sri Aurobindo is not responsible for these records as he had no opportunity to see them. So, it is not as if Sri Aurobindo said exactly these things but that I remember him to have said them. All I can say is that I have tried to be as faithful in recording them as I was humanly capable. That does not minimize my personal responsibility which I fully accept. Sri Aurobindo: I do not mean that the Indian States must adopt parliamentary institutions, or even that India must copy them from Europe. You think that the opposition between the State and the popular party must always be there. That is the European idea. It is not necessary to have that kind of opposition at all. Disciple: Was there no such thing in ancient India? Sri Aurobindo: There was; you need not have the same thing to-day. In India the communal freedom was very great. The communities had great powers and the State had no autocratic authority. The State was a kind of general supervising agency of all the communities. What these modern princes can do is to create great centres of life amongst their subjects, so that they may be the seats of real power and life of the nation. The princes need not take part as leaders; but they can help the growth of the nation. Disciple: In olden times, had the villages also such great powers? Sri Aurobindo: Yes, they had; it is the European idea that makes you think that the parliamentary form or constitution is the best. We had great communal liberty and the communities were the centres of power and of national life. The king could not infringe the right of the commune. Disciple: The communities must be strong and living enough not to allow their rights to be snatched away. Sri Aurobindo: It was so; the king had a continuity of policy from father to son and he could not infringe the rights of the communes; and if these rights were interfered with the people at once made themselves felt. That was the form which the genius of the race had evolved. You think that this parliamentary government is the best form of government. In fact, that form has been a success nowhere except in England. In France, it is worse, in America, in spite of their being an Anglo-Saxon race, it has not succeeded. Disciple: In Japan, is it the European form? Sri Aurobindo: I don’t think so; in Italy and in South Europe the parliamentary form is there but they all copied the German constitution and there is no reality behind the form. I don’t understand why everything should be centralised as in the parliamentary constitution. We must have different, numerous centres of culture and power, full of national life, spread all over the country and they must have political freedom to develop themselves. Disciple: Village organisation can also help in the creation of such centres. 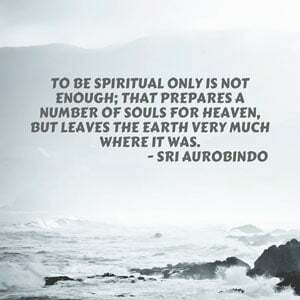 Sri Aurobindo: Yes. But it is not by lectures and sermonising to the village people, as we are trying to do now. Disciple: I have letters from a friend informing me that the organisation of co-operative societies has succeeded in Gujarat. Sri Aurobindo: If you want to work in the village, you must take to a natural profession, go and settle down among the village people and be one of them. When they see that you are a practical man they will begin to trust you. If you go there and work hard for ten or fifteen years you will gain your status and you will be able to do something because they will be prepared to listen to you. The parliamentary form would be hardly suitable for our people. Of course, it is not necessary that you should have today the same old forms. But you can take the line of evolution and follow the bent of the genius of the race. Author: kittureddy Prof. Kittu Reddy has been teaching at SAICE since 1958. and has written two books on India. He also works closely with the Indian army.